The nuclear specter of China has always been India's overwhelming consideration. Indian Defense Minister Manohar Parrikar recently made a controversial “personal” comment that perhaps India must revisit its no first-use nuclear policy. However, the only available document on Indian nuclear policy has been the “Draft Nuclear Doctrine,” which has fostered perpetual speculation on the vector and valences of Indian strategic doctrine. We have had little historical perspective on how Indian doctrine has absorbed Chinese and Pakistan nuclear threats ever since India carried out its first underground nuclear test — “Smiling Buddha” — in May 1974. There is still no consensus on what the historical reasons were for India to cross the no-bomb line or what internal discussions were taking place between the scientists and the prime minister’s office. However, newly declassified documents from the prime minister’s office, which include letters between the prime minister’s office and the Department of Atomic Energy, as well as correspondence between the prime minister and scientists help establish the specific considerations that went into the making of India’s nuclear doctrine. It revises arguments such as those of George Perkovich, that, in the second half of the sixties, “the (Indian) scientists acted without benefit of a national security strategy or requirement.” The documents reveal disquiet among India’s strategists about China’s repeated nuclear tests from 1964 onwards. Recent analysis of China's military modernization effort has focused heavily on the People's Liberation Army's (PLA) development of concepts and capabilities to deter or delay foreign forces responding to crises along China's periphery. However, China developed these capabilities within the context of broader strategic requirements. This study describes China's overarching national and security strategies and its approach to war and escalation control; summarizes its military capabilities developments; and reviews its concepts for deterrence in strategic and conventional domains. This report is intended as a general reference document for senior defense officials and other policymakers seeking an understanding of the links between China's national development strategy and its security and defense policies, strategies and concepts. The information in this report assesses the perceptions of China's leaders on many critical issues — from their views of the international security environment and domestic and international threats, to their approaches to crisis management and escalation control, to the development of military capabilities and deterrence concepts. As this study indicates, these Chinese assessments are not static; they evolve as China's standing in the world increases and its national interests grow, and the conclusions Chinese planners draw from such assessments also change. The necessity of continuing to monitor and analyze emerging literature and assessments on concepts discussed in this report — particularly those with broader implications for current events, such as China's defense of territorial claims in the South China Sea and prospects for crisis management — will be crucial. When it comes to claiming attacks, the Islamic State seems to believe in the old advertising adage that there's no such thing as bad publicity. The group apparently feels that the very mention of its involvement in an attack, successful or otherwise, will serve to fuel public panic - a strategy that has proved effective. No matter how inept an attacker or how ineffective an assault, the Islamic State is quick to take credit, even where credit does not appear due. One such example is a recent attack in Ohio. Just after 10 a.m. on Nov. 28, an 18-year-old student named Abdul Razak Ali Artan drove onto the Ohio State University campus where he was enrolled. Running his vehicle over a curb, Artan struck a group of pedestrians then exited the car and began attacking passersby with a large knife. About a minute into the incident, a responding university police officer shot and killed the assailant, who managed to injure 11 people in the course of the attack - one of them seriously. Lieutenant General O P Kaushik salutes the incredible soldiers who turned the tide in the 1971 War. Some of the best stories are told by soldiers. They will tell you of hard fought battles that have become the stuff of legend. They will remember each and every name -- of the men they fought alongside and of the places they conquered. They will reminisce about men who displayed exemplary courage that will give you goose bumps; and they will speak with pride of the jawans they trusted with their lives. While the U.S. military depends on access to overseas bases to project military power around the globe both in peacetime and during contingencies, it has faced a variety of political challenges to this access. This report aims to fill a gap in the existing literature on this topic through a comprehensive and empirical analysis of the challenges the United States has confronted since 1945. The authors examine the kinds and severity of access problems the United States has faced and how these have changed over time and suggest how the United States can counter political threats to access. The authors find that, while political challenges to access have occurred regularly, the threat has often been overstated. Moreover, the United States faces two separate access problems: challenges to its peacetime base rights and difficulties securing contingency access permissions. Peacetime and contingency access are linked, but not in the way that many assume. Access to large permanent bases during peacetime does not increase the probability that the United States will be granted permission to use a facility during a crisis. Instead, only enduring partners — nations in which there is an elite security consensus in support of the U.S. presence — offer more reliable access during peacetime and in contingencies. In 1870, Samuel Bourne left India for good, and Charles Shepherd kept Bourne & Shepherd in business for another decade. In fact, he extended its geographical reach well beyond Calcutta, Simla and Bombay, sending photographers to Ceylon, Singapore and Nepal as well as to Madras and other areas of southern India. In 1911, the studio commemorated the Delhi Durbar and during World War I, it was kept busy photographing British and American services personnel. Ownership of the studio changed hands several times and in about 1930, Arthur Musselwhite took it over. A keen wildlife photographer, he was Bourne & Shepherd's last European owner - and like Samuel Bourne, quite adept with the pen as well as behind the camera. In 1933, Thacker, Spink & Company, Calcutta, published Musselwhite's Behind the Lens in Tigerland, illustrated with some of his wildlife photographs. In his introduction, the photographer wrote that the pictures in the book represented "fifteen years' visual study of big game in India". There are tigers, close-ups of elephants, a panther making a kill, and deer. He also had portraits of members of Nepali castes and tribes from Central India. Apart from the images, he added relevant information on cameras used, exposure, types of film; these were "woven into the narrative" that often recorded "intriguing situations when frequently a moment seemed like an eternity". His love for the Indian jungle came through in a slightly melodramatic eloquence: "I have sought to recall certain old battles; the preparation, the expectancy and the sight of your game; of twilight when the sun burns down and the dusk brings back the forest night. If I can recapture for the reader some of the thrills, and a touch of the wonder and magic of the Indian jungle, then my efforts will not have been in vain." Populism may be surging in the West, but it’s a phenomenon across the Asia-Pacific as well. Italian voters block a referendum backed by the country’s Prime Minister. Austrian voters turn back a far right candidate’s efforts to gain power. Surprises come from Germany, with Angela Merkel calling for a partial ban on the burqa, and from Sweden as groups playing to anti-immigration sentiment show they are gearing up to make a play for power in that traditionally progressive country in 2018. American commentators tend to frame these kinds of developments as furthering, especially in the Italian case, or countering, in the Austrian case, a populist surge that began with Brexit, gained force with Donald Trump’s election, and has been “crashing in on the western world,” as a Bloomberg piece put it. This interpretation makes sense, but as specialists focusing on the other end of Eurasia, we want to stress the value of swapping a wide-angle lens for a zoom and thinking of developments that have been unfolding over years, not just months. Populism in many forms was already on the rise in varied parts of Asia when Trump’s most widely known catch phrase was still “you’re fired” and the term “Brexit” had yet to be coined. Israeli President Reuven Rivlin’s visit (November 14-21, 2016) to India has come a year after President Pranab Mukherjee visited Israel in October 2015. In the meanwhile, Home Minister Rajnath Singh (November 2015) and External Affairs Minister Sushma Swaraj (January 2016) visited Israel and Prime Minister Narendra Modi is expected to be in Israel early next year. The spurt in high-level political engagements apart, India-Israel relations have been robust with growing cooperation in various areas including defence & security, intelligence cooperation, counter-terrorism, investments, agriculture, water treatment and IT as well as in the field of culture and education. No surprise, therefore, that a large delegation of government officials, businessmen and academics was accompanying the Israeli President. President Rivlin, who arrived in New Delhi on November 14, met President Pranab Mukherjee and Vice President M. Hamid Ansari during the ceremonial welcome in Rashtrapati Bhavan on November 15. Later in the day, he held discussions with Prime Minister Modi followed by signing of an agreement to improve cooperation in the field of agriculture and water resource management. December 7, 2016: In northwest India (Kashmir) the border violence continues. The Kashmir separatists, who have cooperated with the Pakistan backed Islamic terrorists and the Indian government as needed, are now calling for tourists to return, including Indian Hindus who for centuries have come here to worship at the many Hindu shrines in the area. The separatists, who have the support of many, if not most, Moslems in Kashmir say tourists will not be harmed. But that has not been the case in the past. While most Kashmiri Moslems would still like to live in an independent Kashmir, that is unlikely to happen. The main reason why is because of those Hindu shrines, and majority Hindu India does not trust a Moslem government to safeguard them, or guarantee safe access for Hindu pilgrims. The Moslem independence groups continue to be active in Kashmir, organizing demonstrations and strikes. These activities are unpopular with many Kashmiris because they interfere with the returning tourists. In the early 1990s, before the Pakistani Islamic terror campaign got into high gear, Kashmir was quite prosperous because of tourism. Older Kashmiris want to get that back but it is unlikely to happen as long as Pakistan sponsors Islamic terrorist groups across the border in Pakistani Kashmir. Pakistan is getting a new infantry rifle. In late November at the IDEAS-2016 Expo in Karachi, Pakistan’s state-run arsenal Pakistan Ordnance Factories signed a letter of understanding with the Czech small arms manufacturer Česká Zbrojovka. This suggests that Pakistan and C.Z. are about to begin negotiations for Pakistan to adopt, and eventually begin license-production of, C.Z.’s 806 BREN 2 rifle. 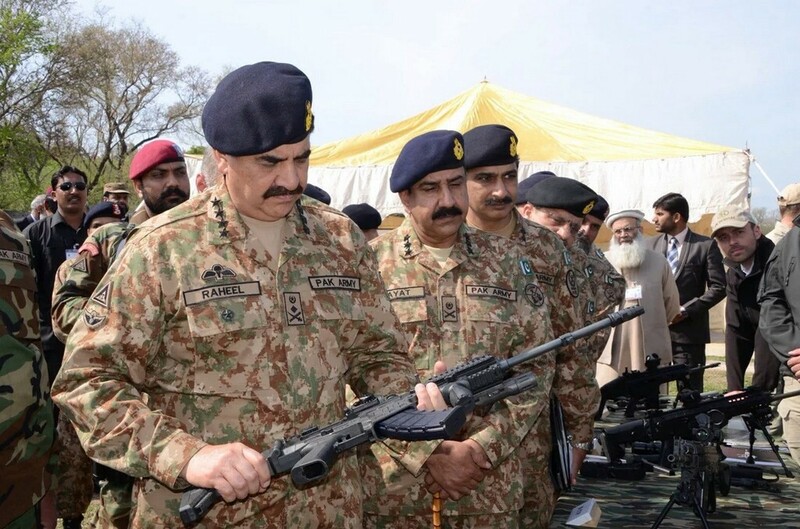 The Pakistani army launched a search for a new infantry rifle in November 2015. Preliminary trials took place at the beginning of 2016 with five rifles — the FN SCAR, CZ-806 BREN 2, Zastava M21, Beretta ARX-200 and Kalashnikov AK-103. The army appears to have tentatively selected the CZ-806 BREN 2. It’s unclear exactly which caliber the new Pakistani BREN 2 might fire, but initial reports suggested a move toward NATO’s standard 5.56-by-45-millimeter round. However, C.Z. appears to have also offered the BREN 2 chambered in 7.62-by-39-millimeter. Pakistani troops currently carry locally-produced Heckler & Koch G3A3 battle rifles chambered in 7.62-by-51 millimeters and Kalashnikov-style Chinese Type 56s chambered in 7.62-by-39 millimeter. KABUL (Reuters) - Afghan and American officials are increasingly worried that any deepening of ties between Russia and Taliban militants fighting to topple the government in Kabul could complicate an already precarious security situation. Russian officials have denied they provide aid to the insurgents, who are contesting large swathes of territory and inflicting heavy casualties, and say their limited contacts are aimed at bringing the Taliban to the negotiating table. Leaders in Kabul say Russian support for the Afghan Taliban appears to be mostly political so far. But a series of recent meetings they say has taken place in Moscow and Tajikistan has made Afghan intelligence and defence officials nervous about more direct support including weapons or funding. A senior Afghan security official called Russian support for the Taliban a “dangerous new trend”, an analysis echoed by the top U.S. commander in Afghanistan, General John Nicholson. What If America Can't Compete with China for Asia? China is poised to draw America's allies into its strategic orbit. Among the central challenges for any policymaker is to ensure that short-term disturbances do not take his or her attention away from longer-term currents—a difficulty that is heightened in an era of social media. A case in point is the furor over President-elect Donald Trump’s conversation with Taiwanese President Tsai Ing-wen. Observers across the world are pronouncing forcefully and definitively on the impact it will have U.S.-China relations when, in fact, several hypotheses are plausible. Gideon Rachman ventures that Mr. Trump’s decision may “eventually be dismissed as an early misstep…[that] will have no lasting significance”; at the other end of the spectrum, he notes, it may precipitate “a fresh confrontation between the U.S. and China over Taiwan.” Gordon Chang, meanwhile, believes that Mr. Trump has “not ‘reset’ Washington’s relations with China but put them on an entirely new footing....Trump, by seemingly not caring about Beijing’s reaction, has cut China down to size, telling its autocrats he does not fear them.” A more banal prediction is that, like his eight predecessors, Trump, too, will pursue some variant of “engage but hedge” once he assumes office. Talking to The Express Tribune (Nov 25, 2016) Pakistani naval officers revealed that Chinese naval ships would be deployed at the Gwadar Sea Port to safeguard the port and trade under the China-Pakistan Economic Corridor (CPEC). A special squadron of four to six ships would be deployed, comprising of both Chinese and Pakistani navies. The ambit of this combined naval force is not only the protection on Gwadar Port, which is designated as a defence entity, but also ensuring security of maritime trade emanating from Pakistan which will have Chinese interests. The Arabian Sea to the African coast, and of course, the Gulf would be its area of operation. Pakistani naval officers also told the Tribune that the role of maritime forces in Pakistan had expanded since the operationalization of Gwadar Port and accelerated development of the CPEC. Gwadar is a Chinese-built and almost Chinese-owned operation. China has a lease of 40 years for operating this port and a Chinese state-owned company with military links is in charge. A decade back, with international focus on this project, the Chinese and the Pakistanis decided to hand over the running of Gwadar Port to a Singapore Company. Many including in India argued that the port had no military plans behind it, since it was being operated by a company, belonging to a third country which was neutral on these issues. HONG KONG, Dec. 6 (UPI) – China’s military build-up is extending to its border with India, according to a Chinese-language media report. Kanwa Asian Defense, a news site specializing in military developments, reported Tuesday Beijing’s military has placed more missiles and fighter jets along the India border. The weapons have been deployed in Tibet and in the western region of Xinjiang along with airborne early warning and control systems, according to the report. Kanwa quoted sources in the Indian navy and air force who said Chinese troops have placed the Jian-11, the Jian-10 and the Kongjing-500 in rotational deployment. The Shenyang J-11 is a twin-engine jet fighter that was first produced in China in 1998. It was built to compete with fourth-generation fighters such as the McDonnell Douglas F-15 Eagle and the Eurofighter Typhoon. The Chengdu J-10 is a lightweight fighter jet and the KJ-500 can carry an airborne early warning system. In the city of Korla in Xinjiang, China may have deployed a troop responsible for the launch of midrange ballistic missiles, and in Hotan, an oasis town in southwestern Xinjiang, the country has been deploying the J-10 and the strategic bomber H-6K. New Delhi (CNN)Outgoing US Defense Secretary Ash Carter touched down in India Wednesday, in a last bid to boost relations with an ally that could prove crucial as China asserts itself. Carter has devoted more personal attention to his Indian counterpart than any other, and that groundwork could prove crucial as the Obama administration prepares to hand over the reins with questions looming about President-elect Donald Trump's commitment to its pivot to Asia and how confrontational he will be with Beijing. The US-India relationship has been ascendant for many years and intensified under President Barack Obama as his Asian strategy sought to balance the rise of China, but the state of the alliance remains mixed at best. The US only recently made small inroads into the Indian defense markets and historical skepticism within India at the prospect of more robust relations with America persists. But en route to New Delhi, Carter told reporters, "India and the United States are destined to be strategic partners." This monograph examines the Indian government’s perspective on the issue of infiltration/illegal from Bangladesh. It analyses the socio-economic and political impact of the presence of a large number of illegal Bangladeshi migrants on the receiving societies within India. It also studies the process of politicisation and securitisation of illegal migration by the political parties, and analyses the events and actions which have shaped the Indian policymakers’ attitude towards illegal migration. While critically evaluating the various measures taken by the government over the years to tackle the problem, the monograph also examines in details proposed solutions such as issuance of work permits and granting amnesty to the illegal migrants as measure to prevent illegal migration. In doing so, it brings forth the wider debates regarding work permits and amnesties, and studies the experiences of some select countries to judge the implications of such proposals. Based on these debates, the monograph argues that before considering proposals such as work permits, it has to be conclusively established that illegal migration occurs in response to demand for labour, otherwise it would result in depressing wages leading to greater hostilities against illegal migrants. On November 29, the Communist Party of Nepal (Maoist-Centre) [CPN-Maoist-Centre]-led government in Kathmandu got registered a seven-point Constitution Amendment Bill at the Parliament Secretariat, seeking to amend the Constitution — adopted in a historical step on September 20, 2015 – and thereby address the concerns of Madhes-based parties. The amendment bill proposes to have only six districts — Nawalparasi, Rupandehi, Kapilbastu, Dang, Banke and Bardiya — in Province 5, excluding the six hill districts of Palpa, Arghakhanchi, Gulmi, Rukum, Rolpa and Pyuthan, and adding them to Province 4. The bill also seeks to amend the constitutional provisions pertaining to citizenship, provincial border, and proportional representation, among others. In fact, the government had prepared the amendment bill in order to address the demands put forth by the agitating Madhesi parties as the alliance of Madhesi parties had served an ultimatum — ending November 28 — to bring an amendment proposal. The Republican chairman of the House Committee on Homeland Security is demanding the United States respond forcefully to Russia’s involvement in the presidential election hacks. Rep. Michael McCaul (R., Texas), a member of President-elect Donald Trump’s national security team, told an audience on Wednesday that Moscow should face “consequences” for directing cyber attacks on American systems in an effort to interfere with the 2016 presidential election. The U.S. intelligence community publicly accused the Russian government of directing cyber attacks on systems used by American citizens and political organizations in October, resulting in an erosion of already frayed relations between Moscow and Washington. While the Obama administration said it planned to deliver a “proportional” response to Russia, McCaul said he had seen no sign of such retaliation. Putin is warning the United States to back off. The newly-released "Foreign Policy Concept" of the Russian Federation contains some interesting changes and updates. Given that this document reflects the Kremlin's strategic mindset and how it views international relations, it is important to take what is says seriously. The fact that the strategy was being prepared in parallel with the U.S. presidential election is perhaps not accidental given two of its most noticeable features. The first is a slight but significant shift in assessing the possibility of the use of nuclear weapons from "unthinkable" to "unlikely." While the concept does not anticipate a high probability of a nuclear exchange occurring, it does warn that the risk of crises escalating between nuclear-armed states is increasing. The second is a very loud and clear restatement of classic Westphalian principles of how states should interact with each other in the international order: on the basis of absolute "non-interference in one another's internal affairs." Should a country not wish to operate from that principle in its relations with Russia, Moscow reserves the right to utilize harsh retaliatory measures to any perceived unfriendly actions. With the ISIL (Islamic State in Iraq and the Levant) threat largely eliminated the major problem remains a lack of national unity. Since 2011 and the demise of dictator Moamar Kaddafi Libya has created three governments and two of them are now competing for power. First came the General National Congress (or GNC), a temporary group whose main job was to create a new constitution for the voters to decide on. The GNC was to rule until the constitution was approved and elections held. GNC failed to attract the support of all factions or agree on a new constitution. In late 2013 the GNC illegally extended its power for another year. Despite that scheduled national elections were held in 2014. GNC did not like the composition of the new House of Representatives (HoR) government and refused to step down. The UN recognized the HoR but most of the GNC members (who tended to be more tribal and religiously conservative) refused to give up power, seized control of Tripoli and became known as “the Tripoli government”. The HoR and the government it had formed fled east to Tobruk and became known as “the Tobruk government”. The HoR rallied most of eastern Libya behind them. The UN recognized the H0R and condemned the GNC. By early 2016 the UN persuaded most GNC and HoR factions to merge and form the GNA (Government of National Accord). The main obstacles to national unity remain some Islamic terrorist groups and tribal leaders seeking a better deal. The problem is worst in the east where many HoR factions have rallied around the powerful military forces led by Khalifa Hiftar. This HoR government is still based in Tobruk and is trying to work out a peace deal with GNA. The four-star Southie boy from Boston brings to DHS the grief of losing friends to America’s drug epidemic and a son to the war on terrorism. In retired Marine Corps Gen. John Kelly, President-elect Donald Trump has nominated for the Department of Homeland Security an outspoken, media-friendly combat veteran who lost a son to the war on terrorism and dozens of childhood friends to the war on drugs. If you think Gen. Jim Mattis is a gruff talker, wait ’til you get a load of Kelly. The Southie boy from Boston was basically muzzled by President Obama’s Pentagon in his final months as the leader of U.S. Southern Command. But he rose to the top exactly because of that frank talk and advice, previously serving as the three-star senior military aide alongside Defense Secretary Robert Gates and commanding troops through the crucible of Iraq’s Anbar province. As the commander of all U.S. troops south of Mexico, Kelly called border security an “existential” threat – not for the people crossing but because of the economic instability rife across Central and South America driving trafficking and instability. He begged Congress for more attention to transnational organized crime, trafficking, and the root causes for America’s ills from the south. He was as close with liberal human rights groups as he was with grizzled Marine fighters. And he was motivated at his core by the fallacies of men. o Operational Assessment: So How Are We Doing? Is the U.S. Prepared for Cyberwarfare? "Cyber threat is growing and more acute over time," said Marcel Lettre, U.S. undersecretary of defense for intelligence. (TNS) -- Cyber-attacks were a hot topic during a national defense forum Saturday at the Ronald Reagan Presidential Library & Museum in Simi Valley, where panelists delivered both good news and bad. The bad news is that "the cyber threat is growing and more acute over time," said Marcel Lettre, U.S. undersecretary of defense for intelligence. The good news is that the potential for a significant cyber-attack on the nation's infrastructure from terrorist groups or foreign countries like China, Russia, Iran and North Korea is still low, he said. Nonetheless, "this is a serious threat that we face," Lettre said at a panel discussion titled "Innovation and Technology in Countering Cyber Attacks." 2016 has been an epic year for cyber security threats. Current projections published from a Cybersecurity Market Report indicate that cybercrimes will only continue grow to an enormous $6 trillion in annual losses to the world by the year 2021. Due in part to our hyper-connected world, advances in collaboration technologies, multiple devices, and increased use of outsourcing, hackers are seizing opportunities and becoming more sophisticated in their attack techniques. Their quest has gone beyond stealing data for a profit to leaking incriminating information to influence and expose individuals and governments. However, hackers are only part of the challenge faced. Third-parties partners also carry a potential threat to organizations as they often have authorized access to organizations’ information and systems with little oversight or monitoring. Organizations that fail to increase their security budget and make security a top priority, are most likely to suffer the greatest financial losses. So what’s do we predict for 2017 besides building a better offense? Big data’s potential just keeps growing. Taking full advantage means companies must incorporate analytics into their strategic vision and use it to make better, faster decisions. Is big data all hype? To the contrary: earlier research may have given only a partial view of the ultimate impact. A new report from the McKinsey Global Institute (MGI), The age of analytics: Competing in a data-driven world, suggests that the range of applications and opportunities has grown and will continue to expand. Given rapid technological advances, the question for companies now is how to integrate new capabilities into their operations and strategies—and position themselves in a world where analytics can upend entire industries. Big data continues to grow; if anything, earlier estimates understated its potential. A 2011 MGI report highlighted the transformational potential of big data. Five years later, we remain convinced that this potential has not been oversold. In fact, the convergence of several technology trends is accelerating progress. The volume of data continues to double every three years as information pours in from digital platforms, wireless sensors, virtual-reality applications, and billions of mobile phones. Data-storage capacity has increased, while its cost has plummeted. Data scientists now have unprecedented computing power at their disposal, and they are devising algorithms that are ever more sophisticated. Recent articles in Real Clear Defense have noted differences between intelligence and information warfare (IW)/information operations (IO). I would agree that the functions of intelligence and IW are different, and neither should be subordinate to the other. Language shapes the way we think, and while both intelligence and IO rely on language to inform or influence, the distinctions are significant. Such arguments go astray when intelligence professionals deride IW as not being on par with the traditional warfare communities. Cyberwarfare alone might not force an adversary to submit if vital interests are at stake- but IW is not limited to cyberwarfare. A significant part of information power is that it can shape what an adversary considers to be a vital interest. For example, is Taiwan or the Ukraine a vital interest to the U.S.? An IO campaign could persuade Americans that neither is vital. If so, political leaders may instruct the military to leave defense plans for Taiwan, the Ukraine, or almost anywhere else on the shelf.